In the box, we have a standard stereo phono jack to patch into the analogue input to your (pre)amplifier. There's a little button on the back to reset the unit to factory settings (hold it down 25 seconds). The standard micro-USB power input goes in the back and in the front (if you look closely in the picture above), the single 3.5mm phono plug output which doubles as an optical TosLink like on Mac computers. As you can see, I have a little TosLink adaptor on the table (not included in the package) to use. 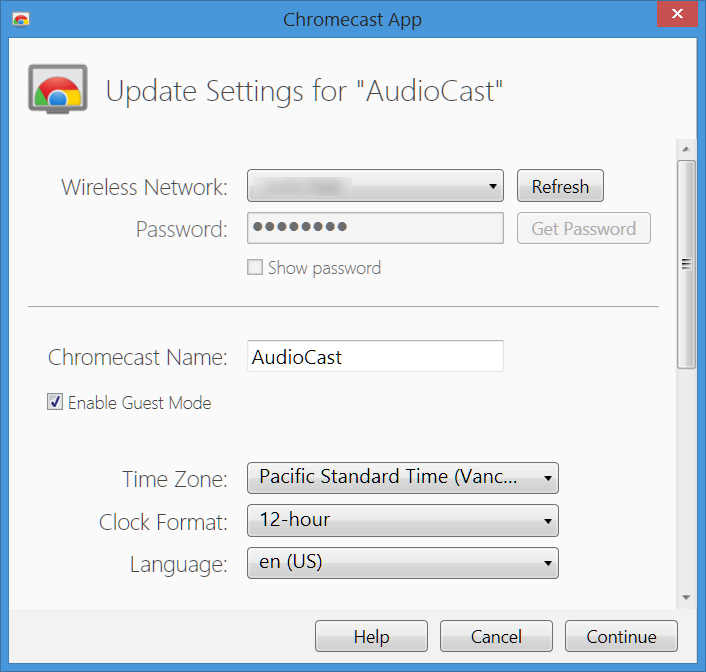 When you initially point your WiFi enabled phone/tablet/laptop at "chromecast.com/setup", it will find the Chromecast Audio at which point you will enter the settings which are saved into the Chromecast Audio so it logs into your home network - worked for me without a hitch... There's a little white LED that lights up when it's ready.Very intuitive install procedure! 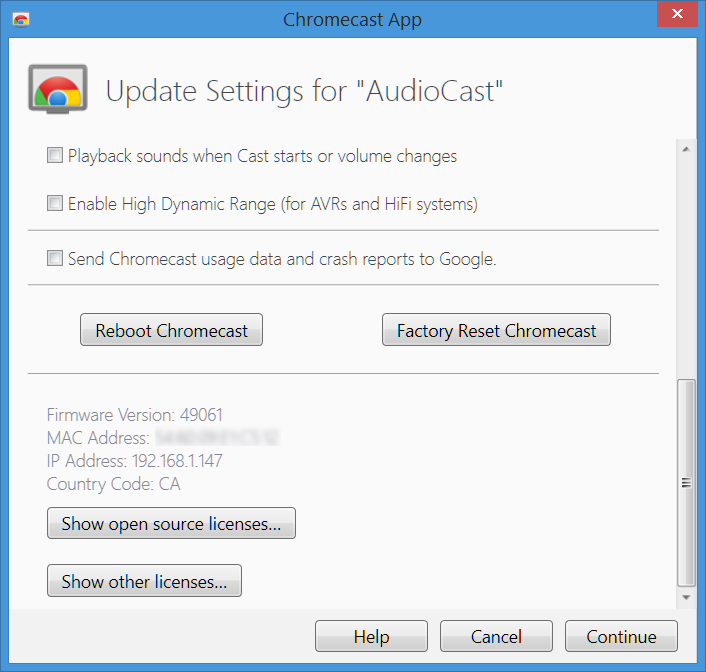 Scroll down a bit... A few Chromecast Audio settings like HDR as well as firmware ID. The unit gets just slightly warm after an hour or so. As you may have heard, as of December 2015, the firmware has been upgraded to allow streaming up to 24/96 (I'm using firmware 49061 as above in these tests). That "High Dynamic Range" setting doesn't seem to change anything in testing when I'm streaming a high quality signal from Plex. I suspect it only affects the sound from lossy streaming with the default being that some kind of dynamic range compression is activated and setting this will disengage the dynamic compression (this seems to be the suspicion in discussions here). In fact, the documentation indicates that the HDR setting is automatically turned "on" when using a TosLink connection. 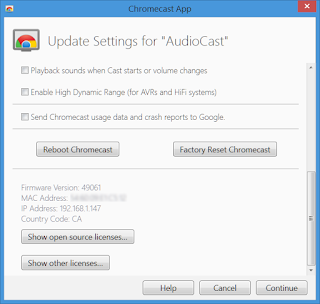 Thereafter, stream away with Chromecast enabled apps/programs. Note that for best quality "bit perfect" streaming, I agree with this Computer Audiophile post to use Plex from my server computer connected to my ethernet. I then would use the Plex control app from my Android cell phone. For these tests, I'll just focus on casting through a music library on Plex running on my Windows Server 2012 R2 machine, using the Samsung Galaxy Note 5 for Plex controls. The WiFi router in my home is the Netgear R7000 which is running DD-WRT firmware - very stable with a current uptime of >100 days. Another server option that's worth looking into is CastBridge for all you Logitech Media Server / Squeezebox users. As the Squeezebox devices age, this could be a very inexpensive replacement! So far, I haven't had time to investigate how well CastBridge works (and with a Squeezebox Touch replacement stowed away for backup, probably will not worry about it in quite awhile!). The analogue output is a stereo 3.5mm standard headphone jack. Indeed, you can just plug in some headphones and stream music from your device using the volume control. Using a 1kHz sine wave and a 20-ohm load, I measured an output impedance of 34.5-ohms. Clearly this is high and not meant to be used with the typical low-impedance headphones these days. Not a problem when plugged into a preamp of course. That looks pretty good. 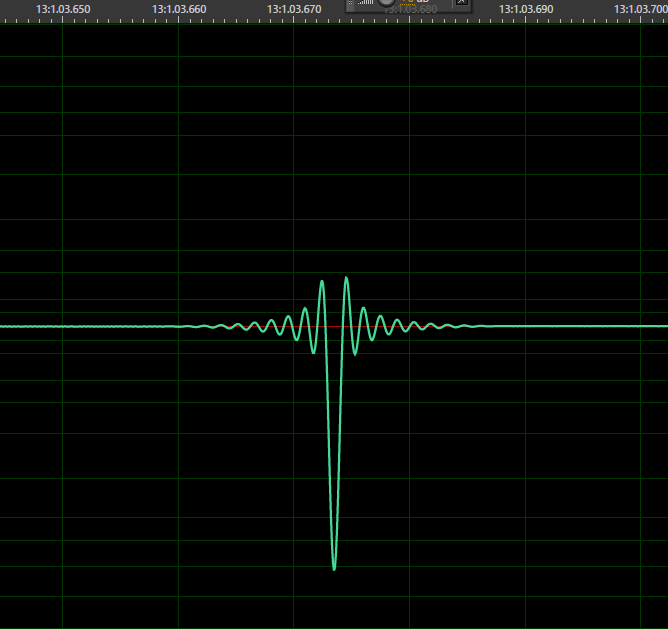 I double checked with a sine wave to make sure there was no clipping. Peak of 2.8Vmax (or a good 2Vrms). Very nice channel balance. A typical symmetrical linear phase filter with equal amounts of pre- and post-ringing. Notice that the phase is inverted. Okay, with 16/44 test signals, we're seeing a digital filter that's quite good with mild interpolator overload with the complex and loud white noise signal. 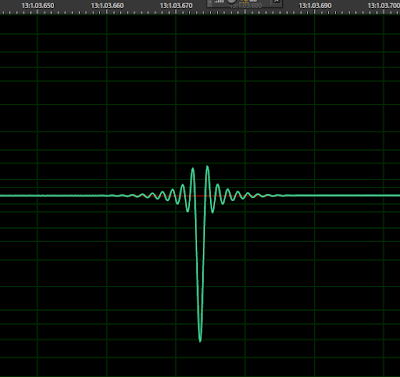 Small amount of intermodulation and aliasing distortion with the 19 and 20kHz signal. Alright, let's see how this thing performs with the audio test battery... As usual, I'll be using my E-MU 0404USB ADC for these measurements described many times over the years. 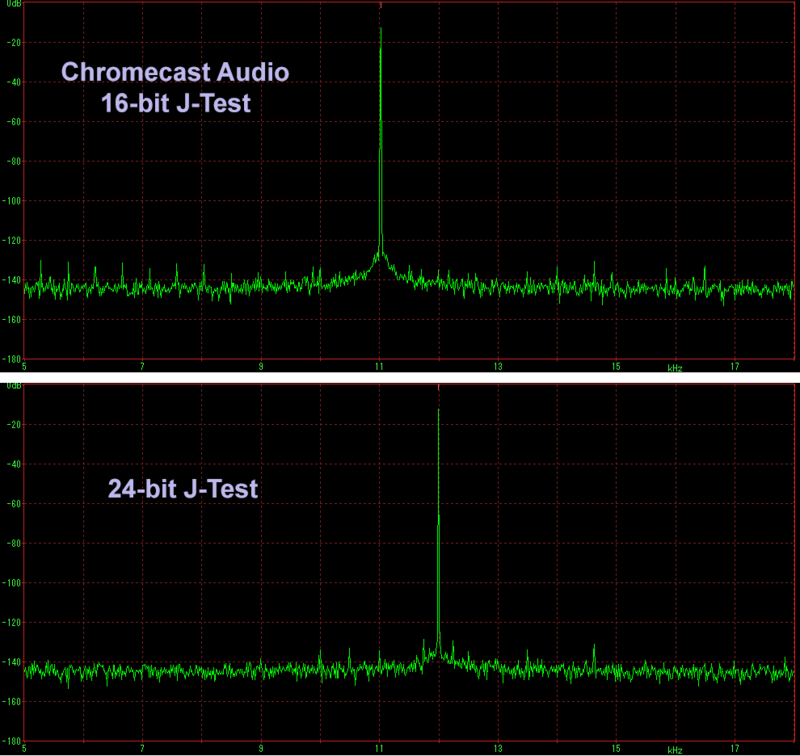 Confirmation that the Chromecast Audio is capable of 16/44 with ease. As you can see, I've compared it with a number of other portable devices, the Light Harmonic Geek Out V2 DAC, as well as a couple Squeezebox streamers (Touch, and Transporter). I've been measuring the 48kHz samplerate more these days with my portable devices. 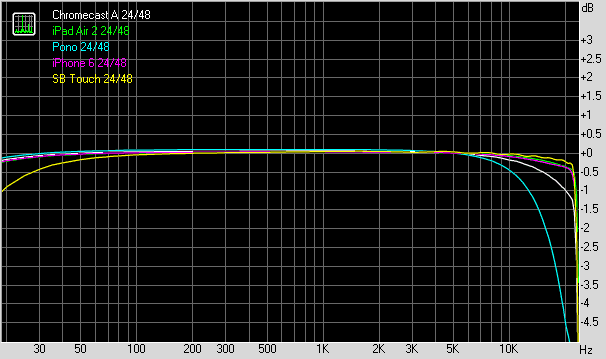 Also, as I have seen quite a number of 96kHz digital files being nothing more than upsampled 48kHz (or what looks like 48kHz material run through an analogue console), 48kHz has become more important to me since I routinely with downsample. As you can see, the Chromecast Audio measures very well! It's achieving about 17.5-bits of resolution; clearly capable of benefiting from the extra dynamic range of 24-bit audio data. 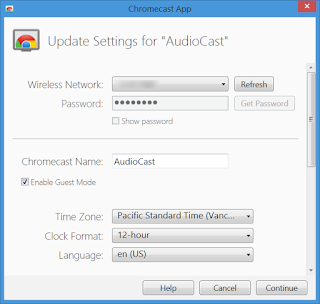 As of the December 2015 firmware upgrade, the Chromecast can now handle 24/96 streaming. What really separates itself from the pack here is of course the Logitech/Squeezebox Transporter; hardly fair given the price differential of course. But it does give the opportunity to compare objectively the range of capabilities between the different DACs and players as it applies to high-resolution audio. 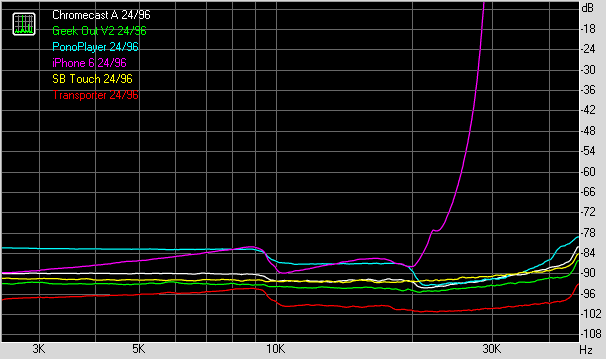 Frequency Response - note that the iPhone 6 resampled 96kHz signal. 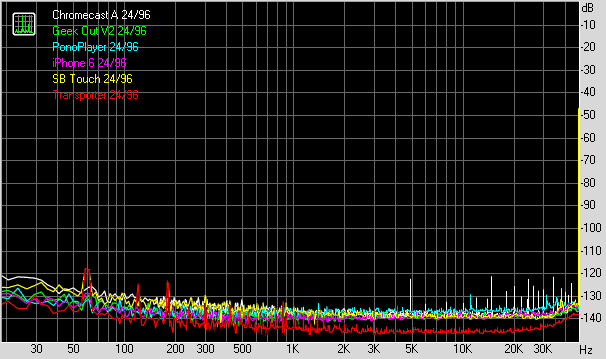 Of note, the Chromecast Audio is -1dB at 20kHz. 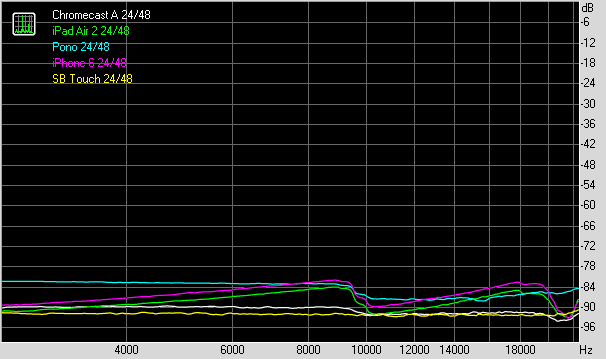 IMD+N Sweep - again, the iPhone 6 is incapable of true 96kHz playback. Impressive result from the Transporter. 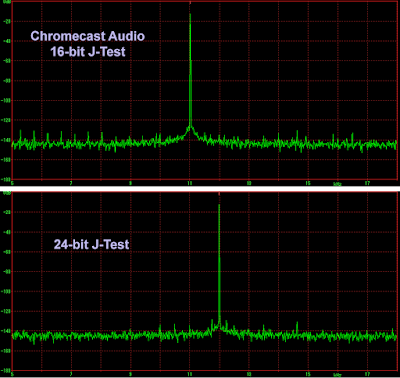 The Chromecast Audio failed to stream at 192kHz through Plex - as expected. There was no audio output at all. As you can see, jitter is a non-issue even with a <$50 streaming device receiving the audio data off a WiFi network. For the sake of completeness, there are a pair of obvious sidebands evident in the 24-bit J-Test of very low level corresponding to +/-250Hz. 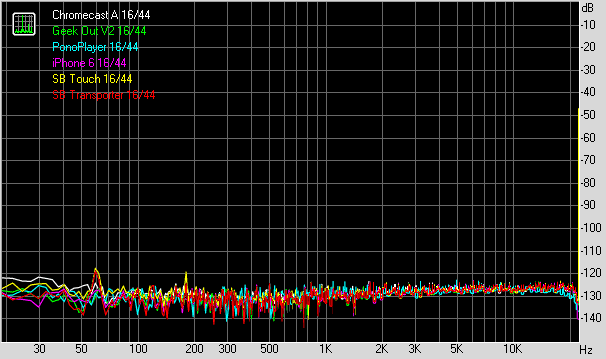 In terms of amplitude, these are 115dB below the primary 12kHz signal! Absolutely irrelevant in ability to impact sound quality. Look, I can write all kinds of things about the music I listened to, etc... But I won't bore you and encourage you to have a listen yourself if interested in this device. Seriously, the analogue output sounds good; just don't plug some low impedance headphones into this thing and expect the best potential audio from it. Also, remember that it's best to use a dedicated streaming source like Plex Media Server for best quality. If you simply cast from your phone or tablet, you're likely sending a lossy and dynamically compressed signal (this is where the "High Dynamic Range" setting on the Chromecast could improve the sound quality). The fact is I don't have a need for this device to act as a particularly high-fidelity source at the moment (I like having it for convenience) but I did listen to the analogue output for about 2 hours in my main stereo system one night - Emotiva XSP-1 preamp (RCA input, 47kohm input impedance), dual Emotiva XPA-1L amps, and Paradigm Signature S8v3 speakers with SUB 1 subwoofer. Sounds great, no harshness nor any obviously objectionable characteristic. Recently, I've been on an Asian music kick. Late last year, going through China and Hong Kong, I picked up a copy of Dadawa's Sister Drum (阿姐鼓, 1995). A Mandarin album consisting of New Age and Tibetan influences. Plenty of dynamics, excellent rendition of nuances, great tonality. On of the most important qualities I enjoy in a good DAC is the ability to render the "depth" of the recording and indeed the Chromecast sounded very good in portraying the "3D" characteristic of this album. 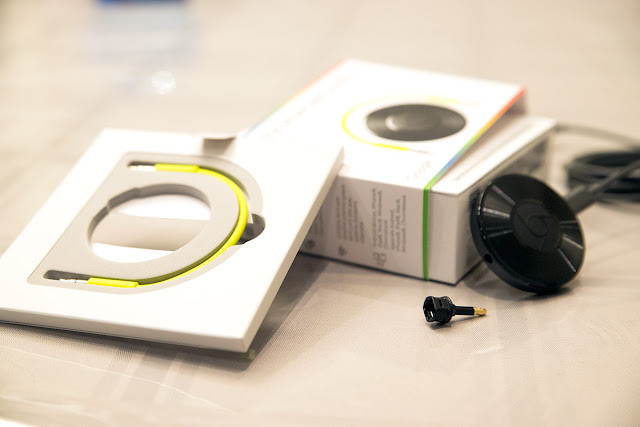 This concludes Part I of a 2-part look at the Chromecast Audio. I had no issues at all with the setup. Remember that for best quality, I did set up Plex server for streaming to the device. As usual when streaming wirelessly through WiFi, make sure the signal strength is adequate, especially if you're going to be doing 24/96. I did not notice any issues with just 2.4GHz Wireless N on the main floor of my house with the router in the basement. Even upstairs where the signal strength dropped below 40%, I did not run into any issues. I suspect the Chromecast has a very good buffering system to prevent under-runs. From a subjective perspective, what else does one really need? I would certainly have no qualms about using the analogue output from this remarkably economical device to feed a good stereo system. Stay tuned for Part II as we have a look at the TosLink/optical digital output. Thanks for the posting Archimago, I don't expect I'll see anything in the Absolute Sound about Chromecast Audio. Also, I just posted my first Medium article on my take of the audiophile world and mention you and your blog - here it is. Yes, I suspect you are right... Don't expect the Chromecast Audio to get many words published on just how well it works. If it does come up on a page somewhere in the "mainstream" audiophile press, I'm sure it'll be along the lines of comparisons with something more expensive and be provided as an example of a typical "utility" device far below what the audiophile target market would want (and I doubt I'll go bankrupt betting that it doesn't sound as good according to them)... Nonetheless, it is IMO these kinds of easily accessible devices that can provide great joy and promote the love of music by making it accessible - and sounding great doing it! Wow! What a blog entry. Love your clarity of thought and sharing of your life journey, man. And that's not just because you mention this blog in a positive light :-). Seriously, welcome to the world of audiophile blogging and I look forward to more of your findings and ideas! Just be prepared with some flame-retardant outerwear when wandering in some corners of the Internet. I think your comment about the migration and expectations of the shift from print to Web media is spot on. At this juncture in history, for a relatively small hobby like high-fidelity audio, after years of a certain (subjectivist) point of view, democratization of the tools to create and disseminate content I believe will be a big factor in shaping the hobby ahead. I think history will show in time the true allegiance of the "silent majority" as it pertains to audio fidelity and the hardware. PS: Nice Raspberry kit. Tempted to put one together myself after seeing that! Good to hear they measure well. I Just ordered two of these as replacement for the horrible wireless connections of my the Marantz Consolette (MS7000). While these are great sounding all-in-one units I have never seen anything as bad when it comes to software support and conectivity. 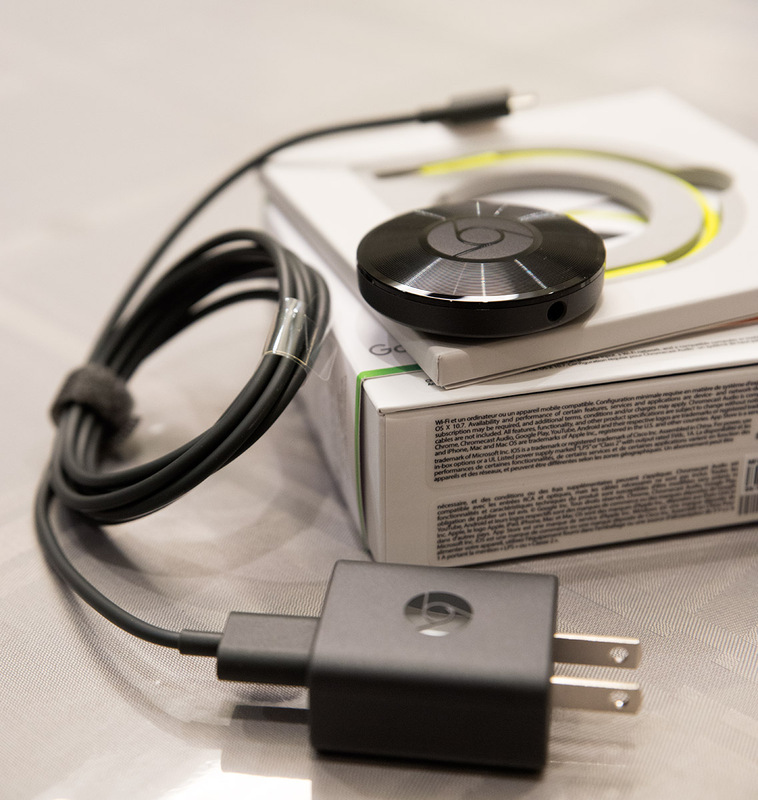 I plan to use the usb connectors of the MS7000 as power supply for the chromecast, so there hopefully will not be be to much clutter. I am planning to use jrivers gizmo (or jremote, should this be available later this month) and a jriver server to stream to the chromecast units. Cool. Let us know how this works out! That does sound like a great way to stream to the Consolette on USB power. I think you're mistaken regarding the FDR/HDR option in the Chromecast settings. It seems to be nothing more than a simple output level switch, there is no compression either way. With FDR on, the output is 2Vrms, but this can be too much for some devices. Case in point, my onboard sound card clips if I try to record the Chromecast's output at full scale, so I had to use a spare USB ADC to record it. 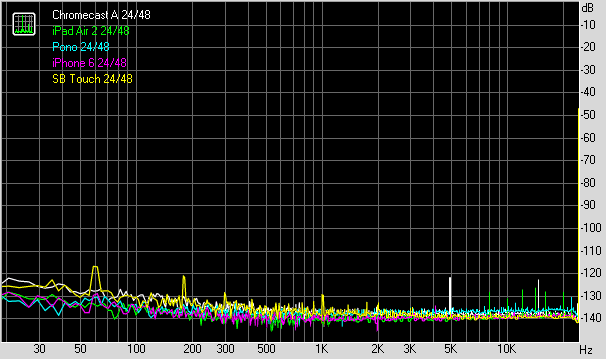 When two recordings with and without FDR are amplified to the same peak level and compared, their Replaygain and DR values are identical. The sheer amount of misinformation regarding this option is astounding, and probably fueled by Google's vague language on their help page. Thanks Kozmo. Yeah, I admit much of it seems like speculation... Interesting point. I'll see if I can try the same the next time I give this a look. At the moment I lent the device out to a friend. Yup! Based on sound quality alone, this baby works well :-). Sorry Honza. Been busy with other stuff and work :-). Plus haven't met up with the Lumia-using friend. I'm curious is there anything special about this phone? Are they claiming any special sound quality? No, it is a standard Windows Phone with Snapdragon 400 CPU and no special DAC. But I have some 24 bit FLACs and would like to know if i have to convert them to 16/48 format to play without truncating in Groove Windows Mobile. You should probably just convert them anyway, to save space. There's no audible difference. They also claim higher sampling rates support but I do not use them much because of nyquist, especially on mobile I use almost always 44.1. Doers the standard (HDMI) Chromecast work for casting lossless 5.1 audio? Good question... Don't know. Alas, don't have one at the moment. For the digital test I'd be very interested to know how tightly the multi-room sync feature works, though this assumes you've a) two of them and b) and a recording interface with a pair of synchronised digital inputs. If the're very tightly synced then it allows quite a neat solution for active speakers incorporating digital crossovers (e.g. minidsp or hypex plate amps). E.g. two chromecasts for L/R each which eliminates the requirement for any wires between your music source and the speakers, or between them (i.e. to duplex the digital source signal). BTW to eliminate any wireless issues you can connect these with ethernet, either using the official Google Ethernet adaptor or a variety of usb ethernet adapters + 'micro usb y-cable'. I've a Linksys USB3GIG which is rock-solid for both audio and video. A further note/ thought is that you should be able get an electrical SPDIF signal out the 3.5mm mini jack with some judicious soldering. Thomas, brilliant! However that would be very much beyond the capability of the typical user. Alas, I don't have 2 of these so would not be able to test at this time. Cool. Didn't know about the ability to connect wired with the Y-cable. Even with the powerline ethernet, I would not be surprised if latency would be too much for tightly paired L/R stereo though! 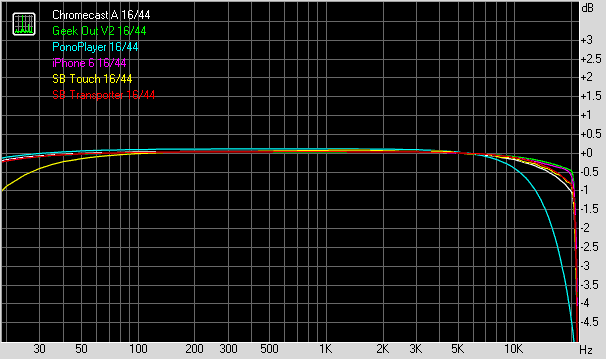 Even with a typical DAC when running through DiffMaker, it's easy so see the amount of samplerate drift over time. I would imagine with 2 independent devices, there'd be significant drift and tolerance would likely not be something ideal like synchronized within a handful of samples at most. Hey, if anyone gives this a try as a DIY solution, I'd love to hear about it and how it goes! I'm using three CCAs in a multiroom setup, and I certainly haven't been able to detect any significant latency in that setup, while playing to all three devices at once. Same here: no audible latency when in multiroom use. As for 5.1 from the video Chromecast: from all reports this works withour problems, but of course you need an AV receiver or similar with hdmi input, or a 5.1 audio extractor. I have 4 CCA within earshot and have noticed giant and unacceptable delay between devices as one is connected via 3 party wired Ethernet (ugreen USB hub). Setting that single device to 100ms delay has solved that problem. But I wonder if L/R usage of CCA as discussed above is possible if no one has measured latency between CCA devices (assuming all wired or all wireless). The time/sample drift between the two devices would have to be extremely low, otherwise you'll run into weird phasing and soundstage issues. It would be a really fun experiment, though. 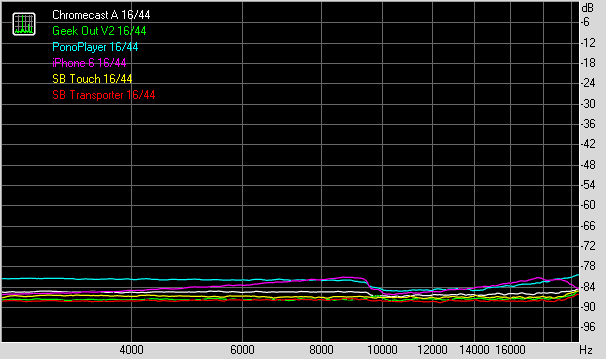 Any thoughts on what impedance would be presented at the 3.5mm output when a CCA is unpowered, or not streaming? 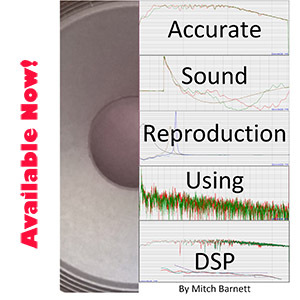 The issue relates to using a simple resistive mixer to take a number of remotely controllable inputs, and pass them to active powered speakers. Whichever input device is enabled and generating audio will pass through to the speakers, but the loading presented by other mixer inputs would change the attenuation of the mixer circuit. 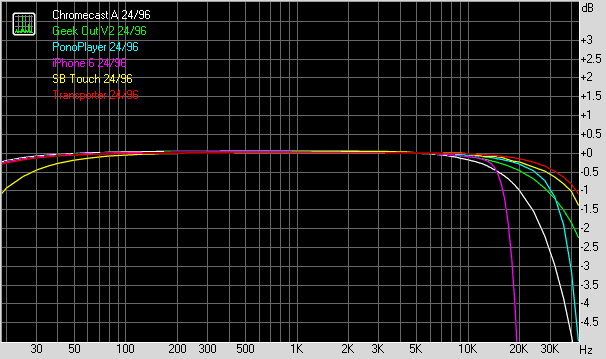 Any thoughts re using the CCA analog output to drive a good headphone amp with mid-fi cans (HE 400i)? Trying to decide if I can do that or if I need a DAC/preamp with optical input in the chain. Thanks for your thoughts and helpful review. I have the same question. I want to run the Plex to CCA > DarkVoice > 6xx for a living room setup. I do t think my wife will object since the tube amp and phones look cool almost like art. Firstly, thanks for your post. I have been using the CCA optical into an Arcam iRdac for playing Tidal lossless on an Arcam A39 for a couple of years now. I have had a nagging feeling which had no actual evidence that somehow the optical output was not giving me the best quality sound I could have achieved if I had some kind of integrated streamer with equivalent Dac. And so for my planned upgrade I had started looking at the likes of the Naim Atom which appears to have excellent integration between streamer, dac and amp. But having seen your article I am just wondering whether I need to pay a premium for an all in one device and actually I could upgrade my amp and dac and keep the CCA as it strike same the streaming functions of amps are the ones going through the biggest changes at the moment and today's hot all-in-one will look a little dated in 5 years. Whereas a solid amp such as the Rega Elicit-R and a chord DAC allow me to shop on the 2nd hand market and mix and match parts in future and plug in a new CCA or whatever if the best alterative I a few years time. So thanks for this vote of confidence on the CCA. The best article that I have read. Thanks for sharing your work with us! I'm really surprised. In my system the CC delivers sub par sound. Just terrible. I wish it didn't because it's extremely convenient and cheap, but it does. My point of reference is Allo DigiOne Signature, which yields a pleasing sound. That, in turn, surprises me. I have a pretty decent system, with Quad amplification and Quad 2805 speakers. The Chromecast sounds just fine, even with its own DAC. I have just bought a new PIoneer U-05 DAC/preamplifier to be used with the digital output of the CCA, and on really good modern recordings the Pioneer sounds a bit better. On older recordings I cannot hear a difference. Unfortunately Google has just discontinued the Chromecast Audio. I havce quickly bouhgt a few spare ones, but for the future I can only hope that they will allow others to make a replacement. After all, the protocol remains, but now principally for Google's Spying loudpspeakers. I agree it's a pity. I got a few spares as well. The CCA that has the most use is the one I have as a headphone amp when casting music via my phone.